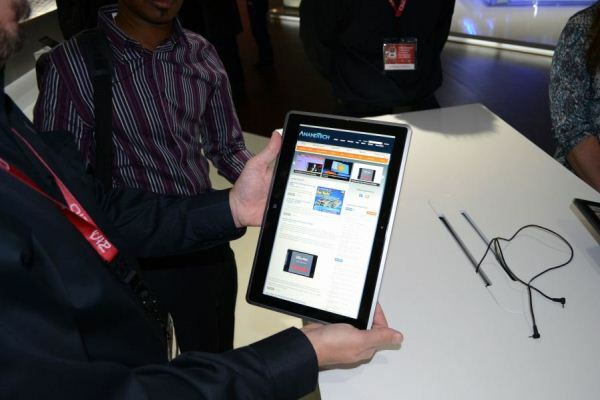 Even with the comprehensive overhaul of their notebook lineup, the big news out of Vizio’s CES booth was definitely their new Windows 8 tablet. 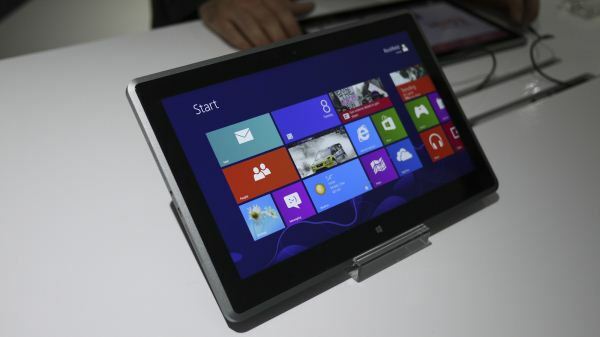 The Vizio Tablet PC is the first system we’ve come across with AMD’s Z60 APU inside. It’s a 1GHz dual-core part, with a pair of Bobcat cores and an HD 6250 GPU onboard. The low clock speed allows it to hit a TDP of roughly 4.5W, easily the lowest of AMD’s APUs, but likely means that compute performance will likely be similar to or slightly worse than Clover Trail. This isn’t unexpected, since we saw the same situation play out with Ontario last year - basically a faster microarchitecture clocked significantly lower such that it performed roughly on par with Atom, except with significantly better GPU performance. In addition to the AMD Z60, the Vizio Tablet PC comes with an 11.6” 1080p display, 2GB of memory, a 64GB SSD, stereo speakers, and Vizio’s now customary industrial design and attention to detail. The chassis is pretty thin at 0.4”, and at 1.66lbs isn’t too heavy for a system of this form factor. It’s a nice design, very flat and clean, and feels good in hand. The frame is aluminum, with a soft-touch back and glass front. I'll explore the hardware fully in the review, but for now, just know that it's a good looking, well executed design. My main comparison point was the Samsung ATIV Smart PC 500T, a Clover Trail-based 11.6” (1366x768) tablet which weighs a very similar 1.64lbs. The ATIV isn’t a particularly well designed system, which I’ll get into in my review, so the Vizio is unsurprisingly a much nicer piece of hardware design, but what really got me was the performance of Z60. Even at 1080p, the Vizio feels smoother throughout the Windows 8 UI than Clover Trail at WXGA. The extra GPU horsepower of the APU certainly makes itself felt when compared to the PowerVR SGX545 in Atom Z2760. This is a good sign, and all of the hardware acceleration capabilities that opens up should make Z60 a much more livable computing situation than Atom. Obviously, it won’t come anywhere near 7W IVB, which I’d say is the current preferred Windows 8 tablet platform (and should be until Haswell comes) but it should be a good deal cheaper. The display is supposedly not IPS but is definitely some wide-angle panel type, so perhaps it’s a Samsung-sourced PLS panel or something similar. Pretty crisp, 1080p on an 11.6” panel is fantastic from a pixel density standpoint. We have no indications on price or release date, but Vizio says that it will be priced “competitively”. Competitive to what still remains a question, since the Z60-based Vizio kind of bridges the gap between Clover Trail and Ivy Bridge tablets, but I wouldn’t be shocked to see it drop at around $800. That puts it on par with the ASUS VivoTab 810C (the Atom one, not the one we reviewed) and just above the ATIV Smart PC ($749) but well below the 1080p Ivy Bridge tablets ($899 for Surface Pro, $949 for Acer’s W700). I’m excited, it looks like a pretty decent offering and I’m glad to see AMD get such a solid design win. Intel has long owned the mobile and ultramobile PC space, so it’s nice to see AMD finally put out a viable chip that will hopefully shake things up going forward. When I really think about it, I know I should wait maybe a yearish for Haswell to come out and Ubuntu to get usable enough on tablets. Besides, my 'old' laptop isn't _that_ old, and works fine. I'm definitely looking forward to this tablet. However, I hope you're wrong on the price point. Considering there are Atom-powered Win8 tablets in the $500-600 range, and AMD's chipset should be significantly cheaper than Intel's, I was more expecting this to be in that range, *maybe* ~$700. Granted the 1080p panel instead of 1366x768 is going to drive the price up a bit, but I still don't see this being competitive at a price approaching that of Ivy Bridge tablets. I believe AMD's TDP figures are for a system including everything except for storage and screen, such as radios. As such, they're not directly comparable and a 4.5W TDP isn't as bad as it sounds. "Also, Z-60 systems do not stay connected to wifi in standby mode. This is a big difference from iPad and Android, which you can rely on to notify you of emails, IMs and the like..."